A little creativity goes a long way in explaining the inherent fire resistance character of mass timber to those who don’t believe. 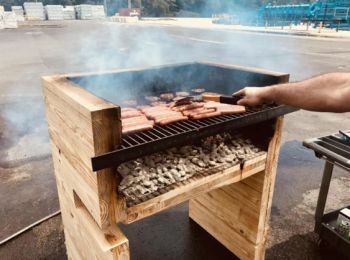 This inspiring photo shows a barbecue grill made of CLT panels. It was made by X-Lam, a New Zealand CLT manufacturer. Once Canada Wood posted it on social media, it picked up over 7,100 views in just two days. It was also retweeted by numerous other social media accounts. Within a couple of days, Sino-Canada Low Carbon, a Chinese CLT manufacturer based in Zhejiang province, had made a copycat and posted the images on its own social media account. “There is nothing more convincing than a heated grill made of CLT to help people understand the basic principle and theory behind the performance of timber buildings under fire conditions,” said Brad Wong, founder of Sino-Canada Low Carbon. As mass timber’s popularity grows, various levels of Chinese government and architects have started paying attention to CLT. On August 1, the Hebei provincial government invited experts from China Southwest Architectural Design and Research Institute, Nanjing Tech University, Canada Wood, the Chinese Ministry of Housing and Urban-Rural Development, and Hebei Academy of Building Research to an internal meeting to discuss the drafting of the new codes. British Columbia and Hebei have been working together since 2009 to expand wood use in building construction. B.C. has assisted Hebei officials in developing wood-frame construction codes and with industry involvement, has shared building technology and expertise.